It is hard to believe that we have been here for two years already! After our first year with all the adjustments and battles with malaria, God has really blessed our second year. 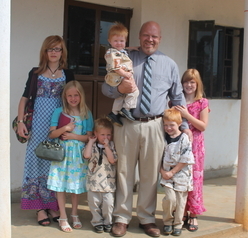 Jim has been able to start Mbira Bible College. Michelle has been able to teach Secondary School as well as music and sewing. She is also playing the keyboard for Mbira Baptist Choir. We are still working on Luganda and are improving, please continue to pray for us!! May 23 - Fly to Uganda!!!!! May 25, 2013 - One year of adjusting and sickness complete. May 25, 2014 - Second year complete seeing God's blessing continue to grow on the ministry in Mbira! !